Working with the Environment. Not against it. Before & After photos to see just what our little hooved friends can do for you. Want to know if goats are right for you? Want a price quote? Or just want to talk goats? Give us a call at 208-337-3900. Or visit the Contact Us section of our site. © Copyright 2019, CT Biological Weed and Brush Control, Inc.. All Rights Reserved. Site Design: TideLine Design, Inc.
You call us, we quote the job, bring the fencing and water (if necessary), and let the goats get to it. The goats eat the weeds, and you have a clean piece of land when we leave. The only evidence that we were even there will be some natural fertilizer left behind. We like to come to your location beforehand so we can see what types of weeds are on your property. 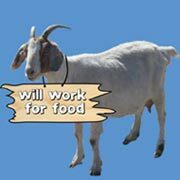 If you have weeds that the goats don’t like to eat, we’ll tell you so neither one of us wastes our time or money.